A Delectable Deck Tempts the Palette for this Upcoming Lakeway City Restaurant. 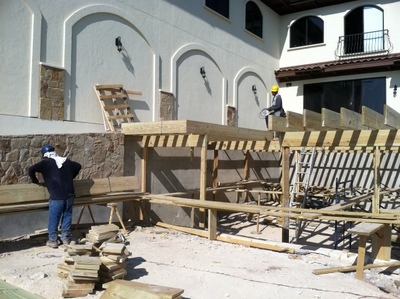 Archadeck of Austin begins construction on this commercial deck in Lakeway City, TX. Everybody knows that when you go out to dinner, the setting and mood of the restaurant are just as important as the cuisine. Fine dining should trigger all your senses – what you see, how it makes you feel, what you hear, and most importantly what aromas are wafting their way from the kitchen to your nose. Of course, your senses should reach their crescendo when you take your first bite of the dish you have ordered. But in order to make that crescendo really memorable, all your senses have to come into play. A well designed, and well-built restaurant can actually make the food taste better by the sights and views before your food ever reaches the table. Many restauranteurs consider setting the mood before you take that first bite as important as the food itself. 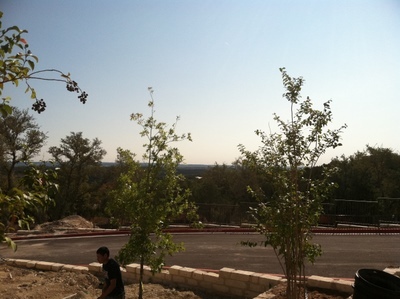 Here is a sample of the "hill country views" that will be visible from the new deck. Setting the mood is the reason this upcoming, Lakeway City restaurant decided to hire us to construct a large commercial deck at their establishment. The deck is still under construction, but we wanted to share the news and the gorgeous views that will be visible atop this fantastic deck when completed. The deck faces the hills and overlooks a canyon, these breathtaking Hill Country Views will offer a wonderful blend of natural imagery to compliment your dining experience. The restaurant will have an inside and outside dining area once completed. Archadeck of Austin is constructing a 1,000 square foot high-end composite deck with railing that will sit 12 feet off the ground. The deck is being built to commercial grade standards which are designed for a higher pound load of 100 pounds per square foot as this meets the load requirements when building a commercial grade deck. Load requirements are very important in terms of safety and keeping the deck hefty enough to withstand larger weight capacity than those you would need for a deck this size in a residential setting. 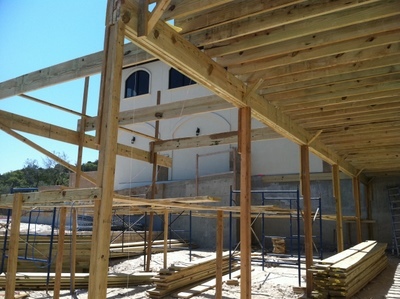 Archadeck of Austin always puts safety first, and obeys all guidelines and standards set forth within the requirements and building codes in the location we are building our outdoor structures. Notice the support system involved in building a commercial grade deck. This entry was posted on September 6, 2011 by austinporchandpatio. It was filed under Austin decks, Commercial decks, Composite decks, Decks, Materials, Multi-level decks, TimberTech Earthwoods Evolutions and was tagged with Archadeck of Austin, Austin deck builder, Austin TimberTech decks, Commercial deck builder Austin TX, Commercial Decks Lakeway city TX, Commercial grade decks Austin TX, Deck builder Lakeway City TX, High-end deck builder Austin TX.